That looks very delicious. Sorry you don't like beans -- I love beans! Arroz, Feijao , bife e batata frita!!! Delicia!!!!!!!!!!!! 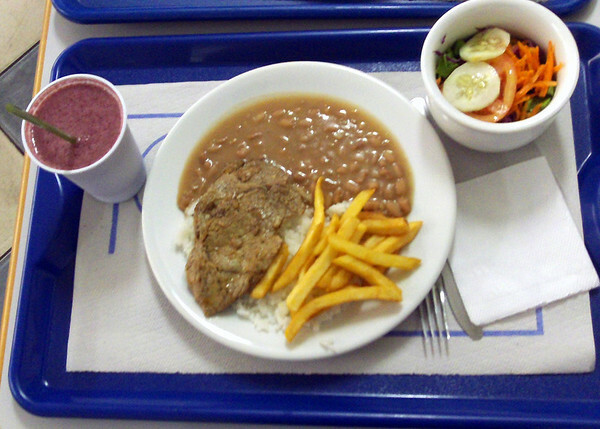 As an Brazilian the thing I miss the most here living in Germany is rice and beans!! I love it!!! R$ 10 Reais is a little too expensive!!! but there is a lot of food!! I love to see this post from Brazil!!!! JR 10 reais is cheap in 2012! O Brasil prosperou muito nos últimos anos, mas os preços subiram também, nem tanto pela antiga inflação, mas muito porque os custos embutidos são altos. Hello and welcome Enzo Buzz. That's a good looking meal to me. And the french fries look perfectly done, not greasy. Have to say I think the price is fair considering you have a salad and fresh juice. In Canada that would cost $8-$10, maybe $12. I like both beans and rice but have never tried them together. Its time has come. When I was a boy we had home baked beans with bacon chunks from a crock every Saturday supper with fresh baked bread, usually brown bread or Johnny Cake (corn bread). Delicious memory! That looks like a filling lunch! Except the beans. I don't eat those, either, so you aren't alone in your dislike for beans, Enzo! Unfortunately, I cook beans only once a week because my triplets don´t like to eat beans so often! Enzo's lunch is a regular meal of middle class' Brazilian children. However, my kids(also Brazilians) don't eat too much salad. I will tell them to visit the blog to read this post! Oh, I forgot, have you checked out by blog, it's www.dragonpile.weebly.com! Minha filha estuda em uma escola técnica federal e 3x na semana ela almoça lá. Hoje estávamos conversando e ela comentou que é obrigado ter arroz e feijão todo dia na escola.